Pig 135 snuffles and grunts inside his pen. 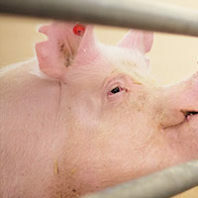 Jon Oatley reaches through the bars to pet the more than 500-pound genetically modified animal. “People have this image in their head of a pig with deformities, but they’re just normal pigs,” says molecular biologist Oatley ’01 MS, ’04 PhD as he rubs the pig’s ears.